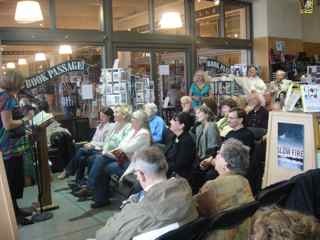 Book Passage, Ferry Building S.F. Speaking of fav. bookstores, in the Bay Area it would be hard to complete that sentence without adding Book Passage. But often when people mention the iconic bookstore, they are speaking of the Mothership in Corte Madera, Marin County. Within the confines of its two buildings, so much of the area’s literary life — readings, workshops, salons — takes place that it is a true literary center. But let us not overlook the “annex,” or the other Book Passage on San Francisco’s Embarcadero. There, nestled in among the culinary treasures housed in the old landmark of San Francisco’s waterfront, is the little jewel of a bookstore, it’s windows facing the bay. Directly in front of the store, ferries still dock and bring in their passengers from across the water. With a sweeping view of the Bay Bridge and Treasure Island and the hills of Berkeley and Oakland in the background, it is, one could say, a romantic spot. A romantic spot, maybe, for a reading or book launch. Guess what. It is. 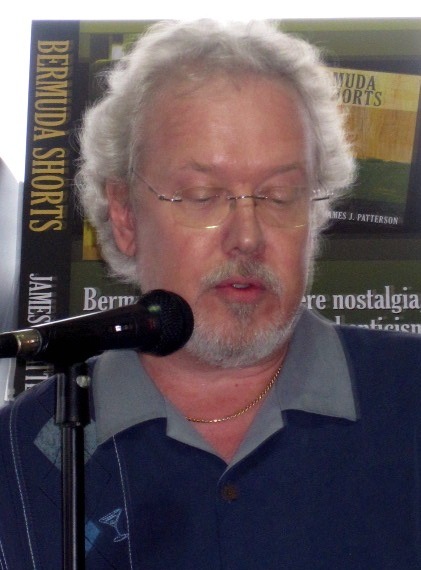 I speak from personal experience, because earlier in July I did launch my new novel, That Paris Year, while my great literary friend launched his book of essays, Bermuda Shorts. James J. Patterson reading from Bermuda Shorts. With the water sparkling and the sun going down on hills, it couldn’t have been a more appealing — or friendlier — venue. There are regular readings there, including an ongoing series of Left Coast Writers who read on the second Monday of the month. So plan on dropping in. Whether you’ve just gotten off work, or gotten off the ferry, you couldn’t do better for a relaxing moment. Pick up some exotic veggie, some superb cheese and great bread, or even some caviar and champagne from one of the vendors for supper, find a great new book or two at Book Passage, grab a cup of Joe from Peet’s nextdoor, then find a spot to contemplate the view. Reading doesn’t get sexier than this.